The beach of Gerakas on the island of Alonissos in Greece, information and pictures. Gerakas Beach is located at the very northern tip of the island of Alonissos, in an almost deserted area. Gerakas beach is situated in a protected bay, where boats like to take shelter when the wind suddenly starts blowing. The beach can be reached by boat over the sea, or by car over a tarmac road. The distance to the port of Patiriri is 23 kilometres and the further you drive the more rugged the landscape becomes. There are not that many pine trees anymore on this part of the island. 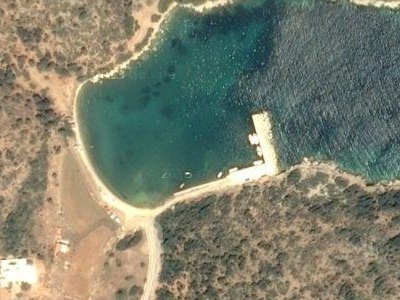 For a long time the Marine Research Station was located in Gerakas. They were engaged in the study and conservation of rare Monachus Monachus seal that lives in the area around Alonissos. Due to financial problems this station is now closed. The bay is mainly used by fishermen and the beach of Gerakas is not very attractive. There are no facilities at Gerakas Beach, so visitors should bring their own supply of water and food.